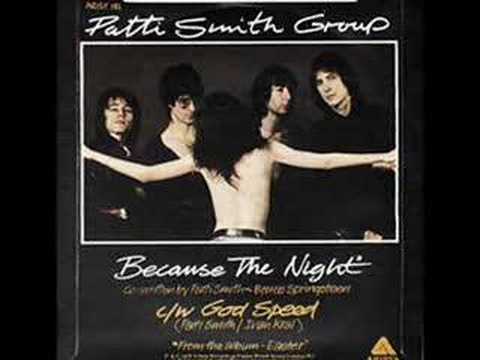 "Because The Night" is the accidental hit, an accidental song in fact, that Bruce Springsteen was ready to discard before producer- impresario Jimmy Iovine (who was in the midst of working on both Bruce's Darkness At The edge of Town and Patti's album Easter), persuaded Bruce to hand off the half-finished tune to Smith. Smith's version - many say the version - opens with a somber, echoing piano, like lights reflected on a rainy city street. Her version (once it takes off) is markedly more up tempo than any that Springsteen recorded live or are found in the outtakes of studio sessions. This is reflective of Smith's involvement with the 70s club scene in New York, most notably CBGB's. Says Springsteen, "Jimmy Iovine, who was then an engineer... he drove me to Coney Island, and somehow talked me into giving up the song, which I'm glad that I did because I wasn't going to finish it, and she finished it." Smith took her sweet Punk time before she even listened to the half-formed song on tape, she admitted, but a late night, lonely-lover vigil waiting for her boyfriend of the moment Fred 'Sonic' Smith to call, spurred her to finally record her biggest hit. In the Springsteen rockumentary Promise: Darkness at The Edge of Town, Smith recalls that night she first heard Springsteen's snippets of the love song: "I was in my apartment and I was having a long-distance romance with (MC5 star) Fred 'Sonic' Smith, who was supposed to call me, and I waited for him for hours and thought, 'Well, I'll listen to that darn song'. It was so accessible, it had such an anthemic tone, it was in my key." Patti Smith breathes lust, loss and fear into "Because The Night," with a wash of anger thrown in for good measure. While Springsteen's version is, perhaps, musically more adept, it hits one conceptual note over and over: weariness - in keeping with the period of Darkness At The Edge Of Town. Smith's is also reflective of the downtown dance scene in New York in the late 1970s, dislocating, the birthplace of hook-up culture - arty, moody, dancing till dawn in a manic spiral. The Patti Smith Band is highly proficient. Jay Dee Daugherty on drums is particularly fabulous on "Because The Night." Lenny Kaye, although an outstanding guitarist, suffers by comparison with Steve Van Zandt's roaring, A-list playing on Bruce's live version, one of Van Zandt's finest moments on stage. Smith's vocals are as wondrous and luminescent as a wounded animal unsure of her fate. Her altered lyrics (as opposed to Springsteen's original words) reflect the pain of uncertainty. Bruce's lyrics represent a set of desires to be fulfilled. He writes from a tired workingman's perspective while Smith writes from the universal human one, pleading not just for love but for existential relief. Listeners have always longed for more accessible tunes from Patti Smith, based on the early promise of the towering collaboration of "Because The Night." They have been too often disappointed. Sadly, while doing her devoted core audience a solid, she has not done the rest of the world an artistic favor. "Because" is there to savor, though. Bold, brilliant, among the greatest Rock-N-Roll songs of all time.